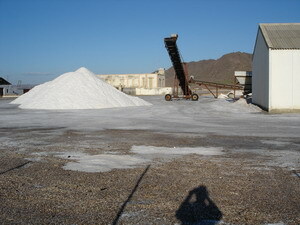 Up to the 19th century there used to be quite a number of salt works along the coast of Almería. Gradually they ceased to be economically worthwhile and today there is just one left. All of them relied on flooding from the sea into salt pans where they were sun dried. All along the south-western coast between Adra and Roquetas were salt marshes and lagoons.The Spanish and Portugese have a special name for this type of terrain, where the lagoons are brackish rather than salty, and are protected from the sea by low sandbanks.It is called albufera (albufeira in Portugese).It comes from the Arabic al-buhaira meaning lagoon. It made the construction and filling of pans easy because all that needed to be done was to cut a channel through the sand bank.Huge chunks have been eliminated by buildings and invernaderos (plastic greenhouses). Fortunately some parts are now protected. These were the most westerly pans, a few km before Adra and the boundary with Granada Province. 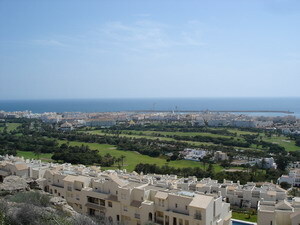 Today they are gradually being built over by the ever-expanding resort of Almerimar and its golf courses. At the moment, however, it is still possible to see the some remnants of the area. One of the loading bays still just visible in the waves.A narrow gauge railway took the salt from the pans to the pier.Before the piers were constructed, the salt was taken to the sea in carts. 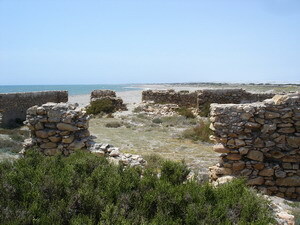 Past Almerimar, the albufera stretched along the coast for about 15km to Roquetas. 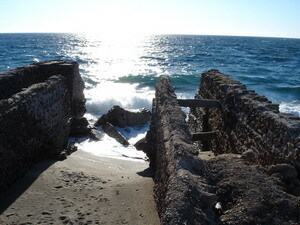 A huge chunk has now disappeared under the resort of Roquetas de Mar. Fortunately the encroachment now seems to have stopped as what is left has been designated a natural park. Car access to the beach here is limited to a few tracks but there are many paths. The old pans have now merged into the natural ones, leaving a wild and attractive marshland scene (try and ignore the miles of plastic greenhouses [invernaderos] behind). Some buildings remain but they are in a ruinous state. 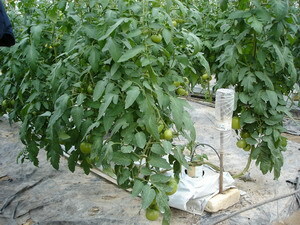 Some tomatoes growing in a nearby invernadero. In 1997, when I first came to this area, the salt pans could easily be seen. Today, there is no chance! This region, between Roquetas and Aguadulce is now a complex of supermarkets, hotels, flats and a Stadium. These are the only salt works still working. 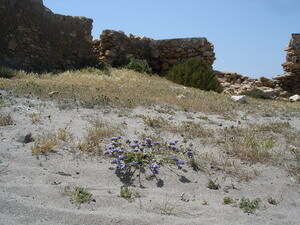 They are situated within the Cabo de Gata Natural Park and are to be seen on the road to the cape. Quite a lot of the albufera is now protected and nearby to the salt pans there are hides where the wildlife can be observed, including flocks of flamingos. Up to the late 19th century, as in many countries, salt was governed by the state and could only be sold in official shops. Thus salt works were state owned. In 1872 the Cabo works were sold to a French company.They invested a lot of money but flash floods kept destroying the pans. Two successive concerns suffered from the same problems until finally a protecting wall was built. A railway was constructed to the sea to take the produce by boat. Today, road transport is used. 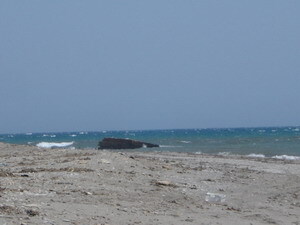 Remains of the pier from when the salt was taken away by boat.